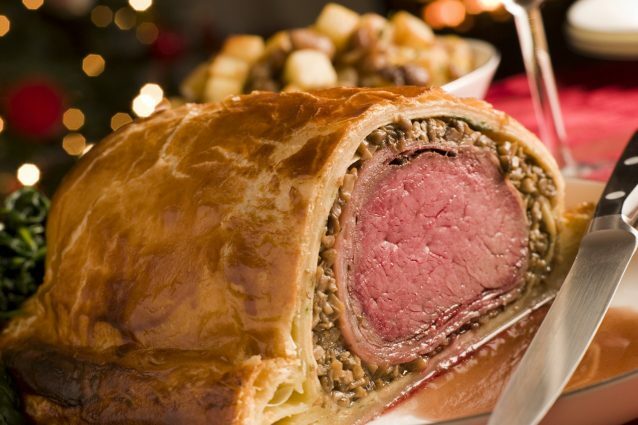 The meatloaf Wellington is a second delicious meat course, ideal for any celebration or special occasion, also because it is very simple to make, and very beautiful to see. 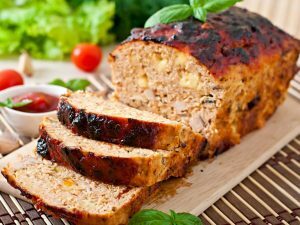 The meatloaf dough is stuffed to your pleasure with stir-fried vegetables or with cured meats and cheeses, and for the crust you can choose puff pastry, bread pastry or shortcrust pastry. The Wellington meatloaf recipe I propose you includes a filling with cooked ham and provola cheese and a puff pastry crust. Soak the stale bread crumbs in milk. Put the beef mince, the eggs, the grated Parmesan cheese and the squeezed bread crumbs into a bowl (1). Knead, and add salt and pepper. Amalgamate everything well and lay it on a sheet of baking paper, trying to create a rectangular shape. Add the slices of provola cheese, the cooked ham (2) and roll the dough helping yourself with some baking paper. Compact well the dough, sealing the ends and giving it the shape of a meatloaf (3). Cook the meatloaf in the oven at 180 ° C for 40 minutes and then let it cool down. At this point, wrap it in the puff pastry and seal the ends, cutting off the excess if necessary. Then put it in a plumcake mold covered with baking paper (4) and incise the surface with a knife. Then brush the surface with a mixture of beaten yolk and milk (5) and bake again the meatloaf. Cook it in a preheated convection oven at 180° C for about 20 minutes, until the surface will be quite golden. Then take the meatloaf Wellington out of the oven (6) and let it cool down before serving it. For an even greater result, cover the meatloaf first with bacon slices and then with puff pastry. Instead of provola cheese, you can also use a seasoned cheese such as Asiago or you can add some slices of stretched curd cheese to the filling. An excellent alternative filling is based on vegetables, such as rapini or spinaches. 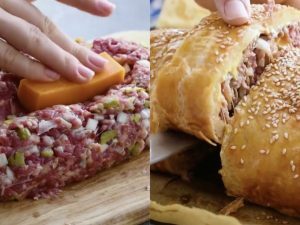 Cook the meatloaf before covering it with the puff pastry to avoid the puff pastry from excessively absorbing the cooked meat juices. Giant Cheeseburger Wellington, perfect for a tasty lunch or dinner!